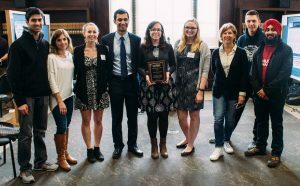 In recognition of the pivotal role that mentors play in supporting undergraduate research and creative activity, the Office of Undergraduate Research is pleased to announce the recipents of the 2017 Mentorship Excellence Awards. 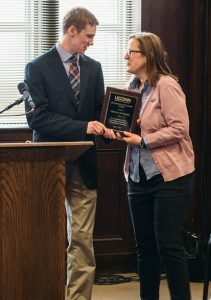 These awards recognize two faculty members – one in a STEM field, and one in a non-STEM field – and one graduate student who exemplify the ways in which outstanding mentors challenge and support their students, enabling them to take intellectual risks and achieve milestones they might not have initially envisioned being able to reach. The 2017 Mentorship Excellence Awards were presented to Virginia Hettinger, Morgan Tingley, and Amanda Coletti during the Frontiers in Undergraduate Research Poster Exhibition on Friday, April 7, 2017. Professor Hettinger’s award was presented by Peer Research Ambassador Tom Cotton ’17 (ENG). The following text is excerpted from Tom’s presentation remarks. Tom Cotton ’17 (ENG) presents the award to Professor Virginia Hettinger. By involving students in research, both in the classroom and through mentorship of independent projects, Professor Hettinger had developed her students’ understanding and appreciation of different types of political science research. Further, she has encouraged her students to pursue opportunities they doubted they could achieve, whether that is submitting a University Scholar application or competing for a national fellowship. Her advisees describe how she has provided just the right kind of mentorship at a given moment, whether that was a gentle push to try something new, guidance on how to resolve a problem, or encouragement to persist in spite of challenges. 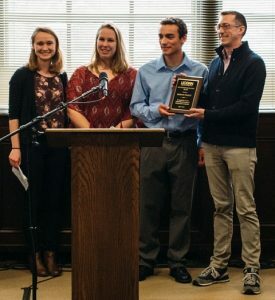 Professor Tingley’s award was presented by Genevieve Nuttall ’18 (CLAS), Sarah Rumsey ’19 (CLAS), and Nicholas Russo ’18 (CLAS), three undergraduate researchers mentored by Dr. Tingley. The following text is excerpted from Nick’s presentation remarks. Professor Morgan Tingley, at right, with his undergraduate mentees. Under Dr. Tingley’s guidance, I reached a major goal early in my undergraduate career: publishing the results of a research project in a peer-reviewed journal. He has worked with me intensively over the past three years to make sure I understood how to do ecology, from experimental design to communicating results. Dr. Tingley also stresses ownership of research, which I credit as the major driver of my growth as a researcher. He teaches us the methods and tools of ecological research, including advanced statistics and R statistical software, and expects us to come to him with ideas for how to use them in our research. In fall 2016, Dr. Tingley and I applied for the Jed Burtt Mentoring Grant to cover research expenses for the upcoming field season, and travel to present the results at an ornithology conference Dr. Tingley explained that he never had the chance to attend a conference as an undergraduate, and thought I should have the opportunity. In fact, he couldn’t wait until next year—we presented at the 2017 meeting and spent two non-conference days birding around Florida. Overall, Dr. Tingley’s impressive birding skills, and his cycle of critique and praise of my work keeps me on edge, and motivated to mirror his success in ecological research. Amanda was presented with her award by Emily Norton ’17 (CLAS), one of many undergraduate researchers who works under her supervision in the Conover lab. The following text is excerpted from Emily’s presentation remarks. Amanda Coletti with members of the Conover Lab. I began working with Amanda when she joined our lab as a first year graduate student. Although I was initially nervous to begin working with someone new, we have become incredibly close over the years, and her constant support and mentorship have proved invaluable to myself and others as we learn the intricacies of scientific research. Throughout my time working with her, Amanda has made every teaching experience engaging and thought-provoking. Her passion for science and learning is contagious, and has heavily influenced our own involvement within the lab. While teaching us difficult techniques with skill, she has emphasized the importance of fully understanding our work and how each decision we make relates to our research question. Instead of criticizing us, she turns every mistake into an experience we can learn from. Her determination to involve us and teach us to work independently has led to our development of critical and creative thinking skills that will prove beneficial in all facets of our lives. Amanda’s interest and guidance in our lives goes beyond the scope of lab work. She frequently dedicates her time and energy into helping and supporting her undergraduate team. Whether it be through answering late night stress emails, proofreading countless program applications, or celebrating our accomplishments, Amanda has been there to support us throughout all endeavors. Congratulations to the 2017 award recipients! The Office of Undergraduate Research thanks the undergraduate students who nominated their faculty and graduate student mentors as well as the Peer Research Ambassadors who served on this year’s selection committee.